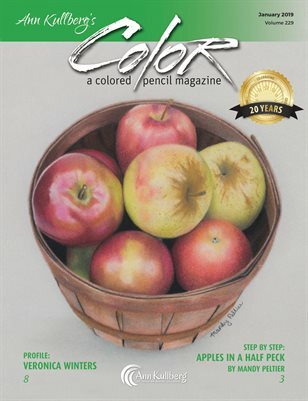 Step by Step: Apples in a Half Peck Apples are the perfect simple subject for beginning colored pencil students but also fun and challenging enough for the seasoned artist. Artist Profile: "Decide what you want, and your growth is unlimited." Veronica Winters dives deep into the artist's mindset and what that means to her. Paying Forward the Love of Colored Pencils by Dan Stancliff. The Words You Use: Good Communication = More Sales. Corrina Thurston talks about how to communicate effectively with clients. Plus Let's Play, What's New Harry, The Pencil Box, Showcase, Tips, SOAR Workshops & More.